One of the great pleasures of being part of Archaeology Live! is meeting people from all walks of life, from all over the world. 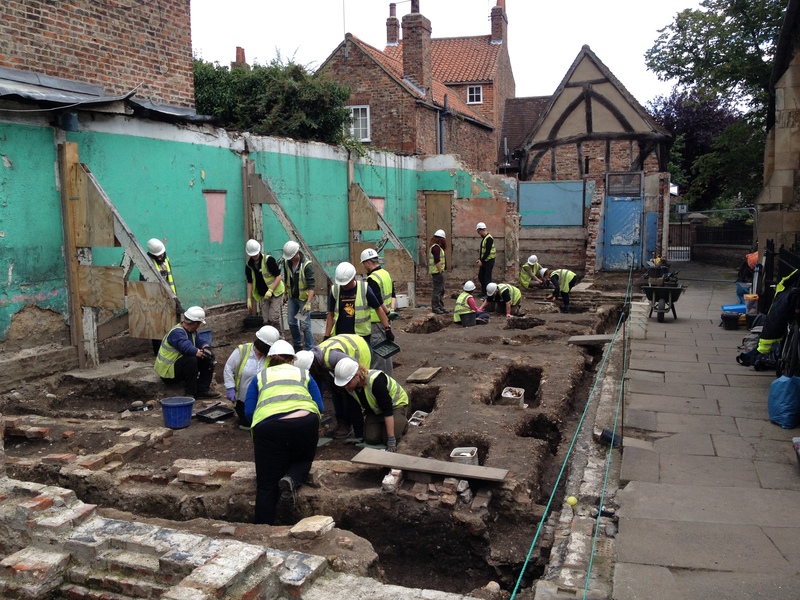 Over the last fourteen years, our Archaeology Live! 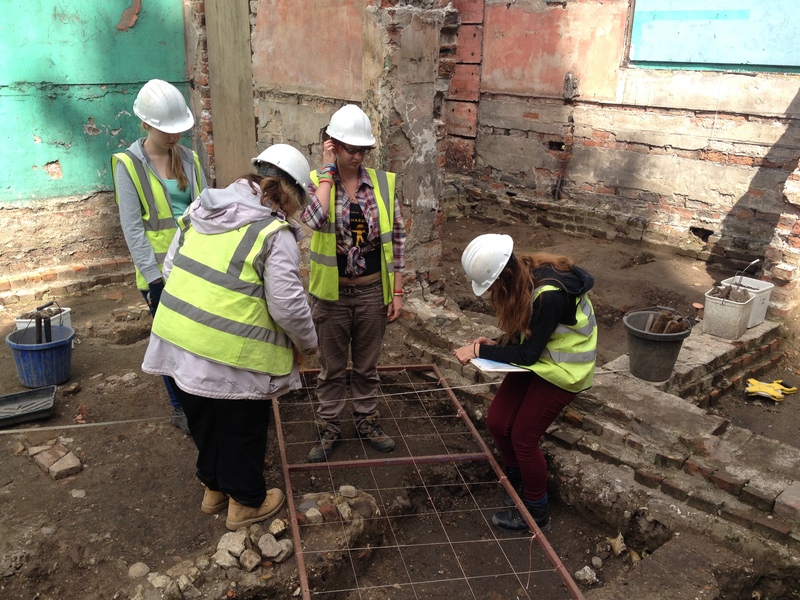 excavations have proved to be a melting pot of new friendships, professional contacts and more than a few budding romances. That said, it’s always great to see the return of a few familiar faces. With Archaeology Live! 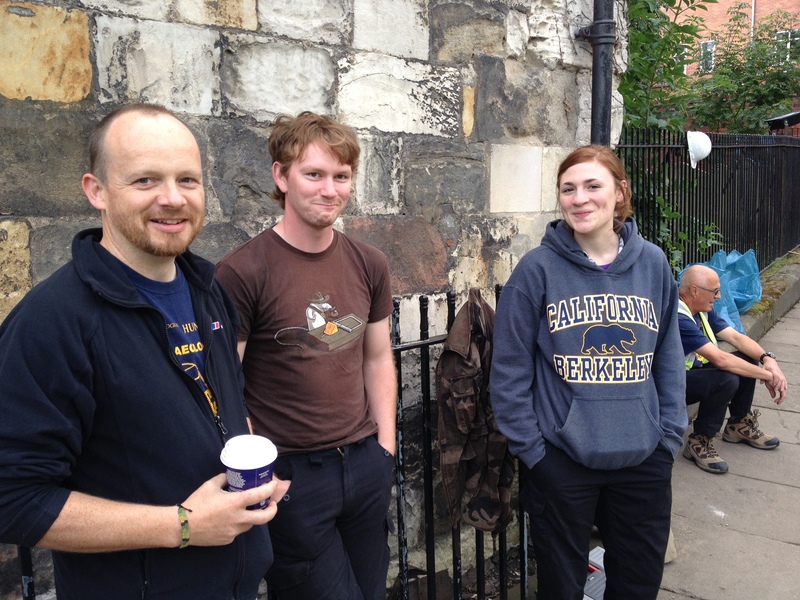 stalwarts Tom, Megan and Chas returning to placement duties, week nine got off to a flying start. Chas, Tom and Megan. It wouldn’t be Arch Live! without them. 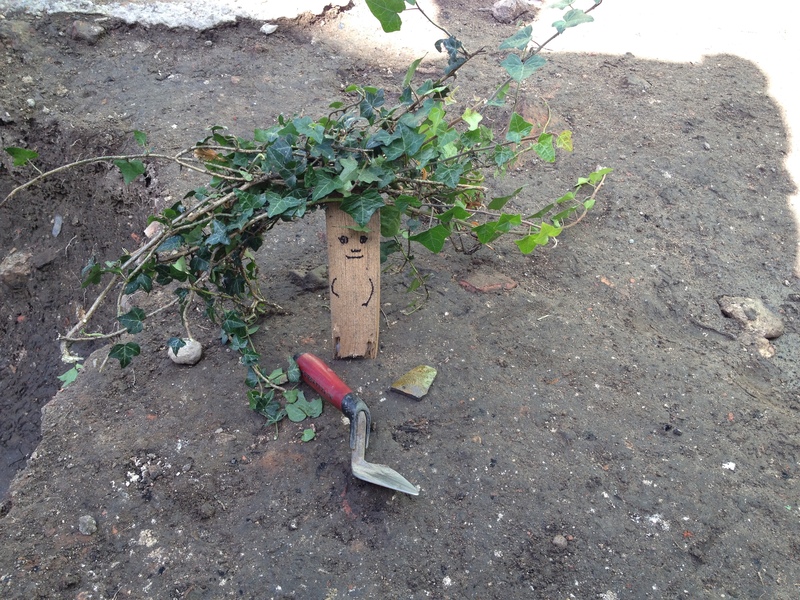 With the new arrivals inducted, suited and booted, trowels were brandished and work began. 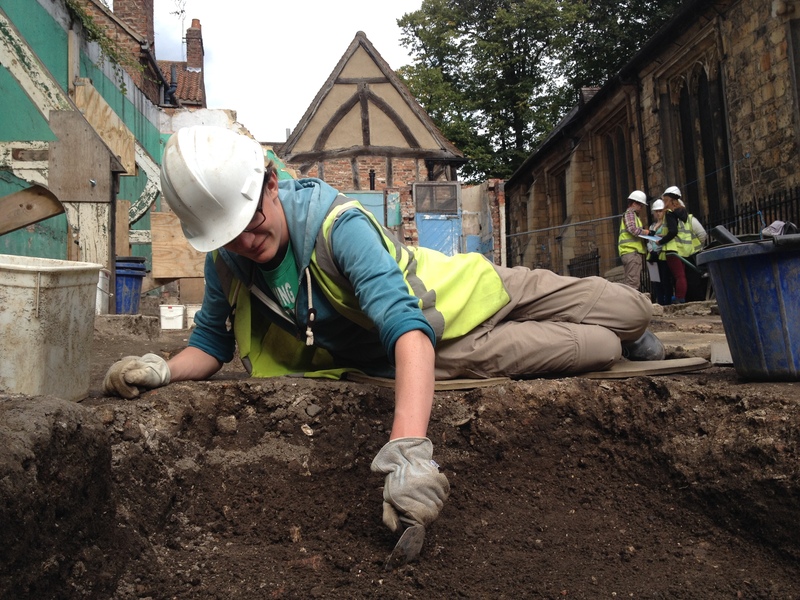 With ‘This End’ becoming increasingly populated by early 19th century burials, Toby’s team cleaned up the central area of the trench. Looking to clear up a number of somewhat fuzzy edges and hopefully expose a few new ones, the new additions quickly got their troweling eye in. Theo and Callum took over work on a large rectangular cut feature that has up to press seemed a tad wide to be a grave. Theo and Callum taking on some tough stratigraphy. As the week progressed, it became apparent that something rather complex was going on. The wide cut feature was in fact several intercutting graves, later interrupted by a shallow charnel pit. The difficulty in tying down the sequence lay in the intensive focus of activity on a very small piece of ground. As each feature cut into its predecessor, much of the earlier deposits were removed, leaving only thin slithers of surviving backfills. Callum in full troweling swing. This discovery effectively turned a single context into a multitude of separate events, each requiring an individual record. 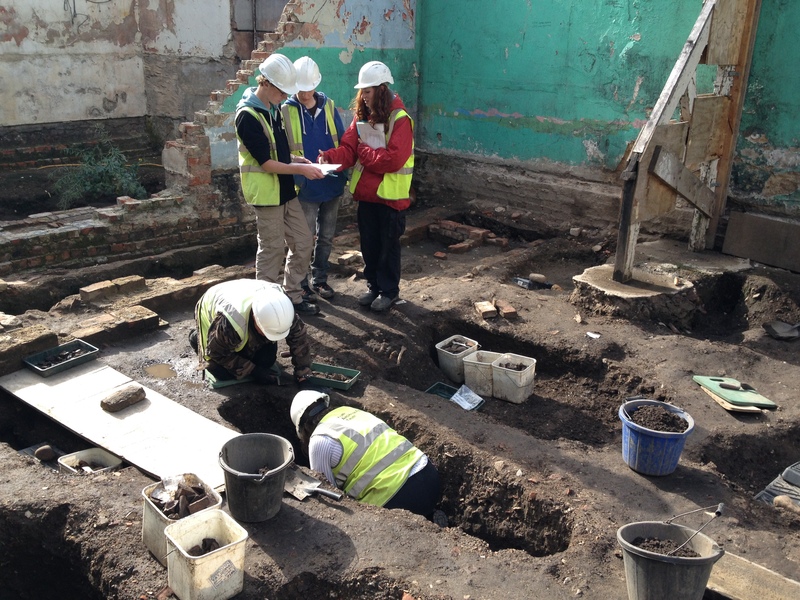 Joined at the end of the week by Hugo, Callum began to record and excavate the sequence of graves and pits. While work on these features will continue over the next couple of weeks, the work done by Callum, Theo and Hugo has made a confusing mass of disturbed edges into a complex, but understandable stratigraphic sequence. Beth and Donald joined us for their third year running this week and faced quite a new challenge. 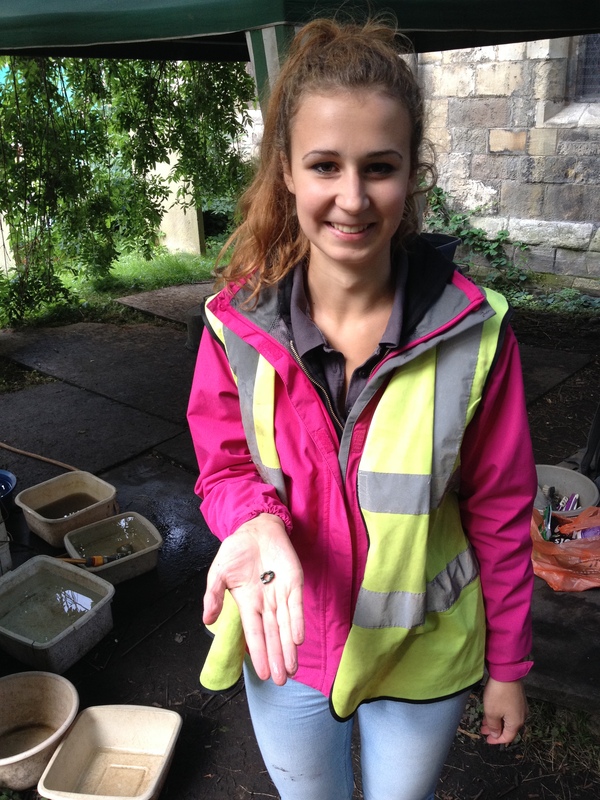 Last year on Hungate, the pair recorded and excavated an early 20th century concrete yard surface, during which Beth managed to break a mattock shaft in two! This season’s work would prove far more delicate. Beth and Donald beginning their week. In the section of a later burial, the grave of an infant had been discovered earlier in the season. Now the feature was free to investigate, Beth and Donald delicately troweled the area to locate the full extents of the burial. As has been the general policy all season, no burials are currently scheduled to be removed during this excavation. 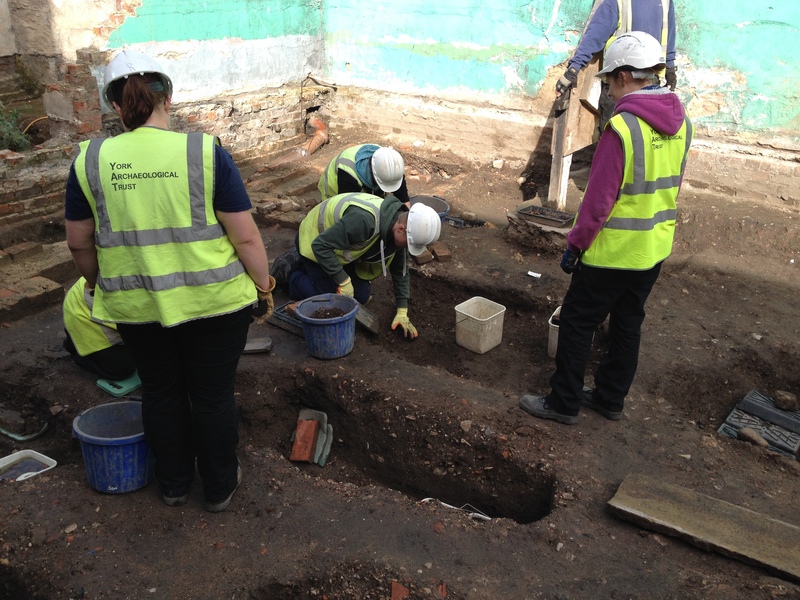 The team have however looked to locate the positions and depths of surviving human remains to ensure they are protected from any intrusion from future development work. Beth and Donald employing their most delicate troweling techniques. As the grave backfill was gently peeled away, the outline of a collapsed coffin became visible, including a very degraded name plate. This discovery is important as it tells us that this was a sanctioned burial and adds a sombre human touch to the feature. These remains, partially revealed by Donald and Beth, will last have been seen by their grieving relatives almost two centuries ago. With respect for the individuals interred along Church Lane, we will not be posting any images of their remains. While public access to our discoveries is perhaps our main aim, features like these are best dealt with quietly and respectfully. 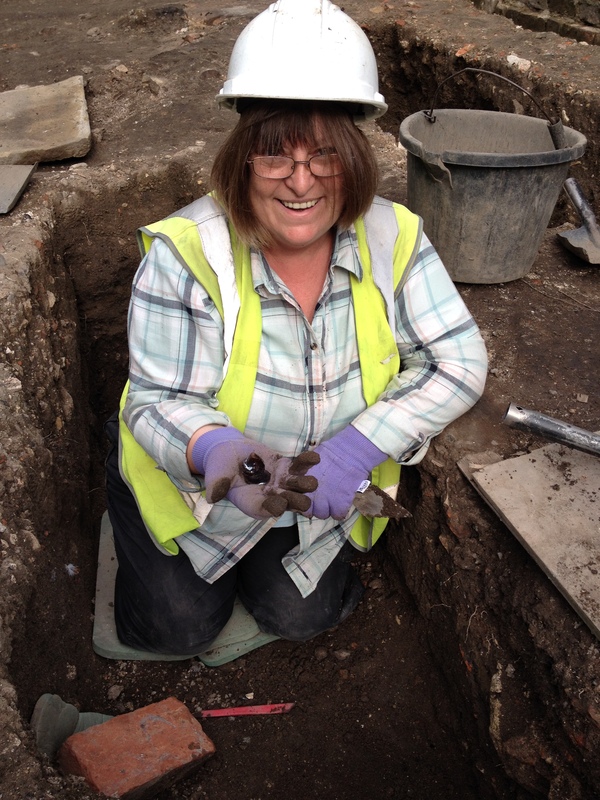 Janice working on a C19th burial. Janice enjoyed a similarly challenging week, as she worked to ascertain the position and depth of the individual interred in her grave cut. 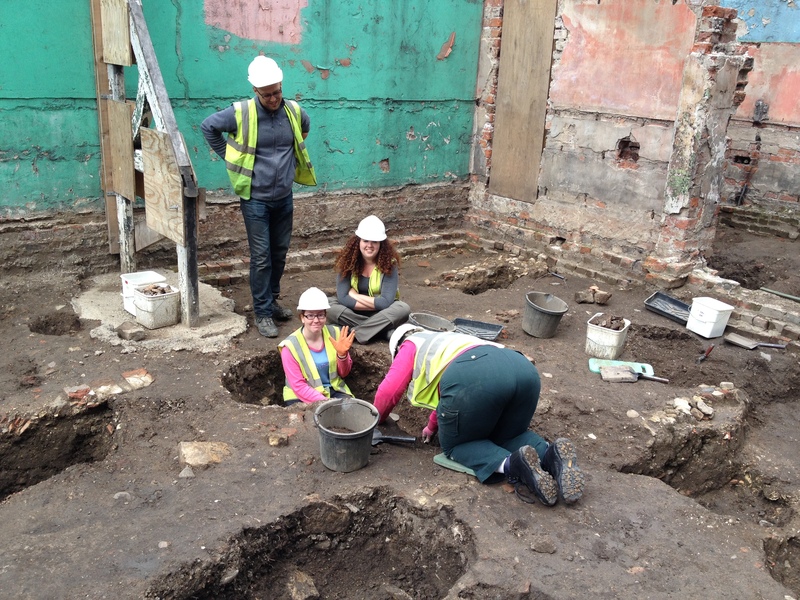 This was tricky work, made harder by the confined space, but Janice’s patient excavation paid off as she revealed the upper and lower extremes of the skeleton. This allowed us to begin detailed records of the burial, again allowing us to ensure that this individual can continue to rest in peace. 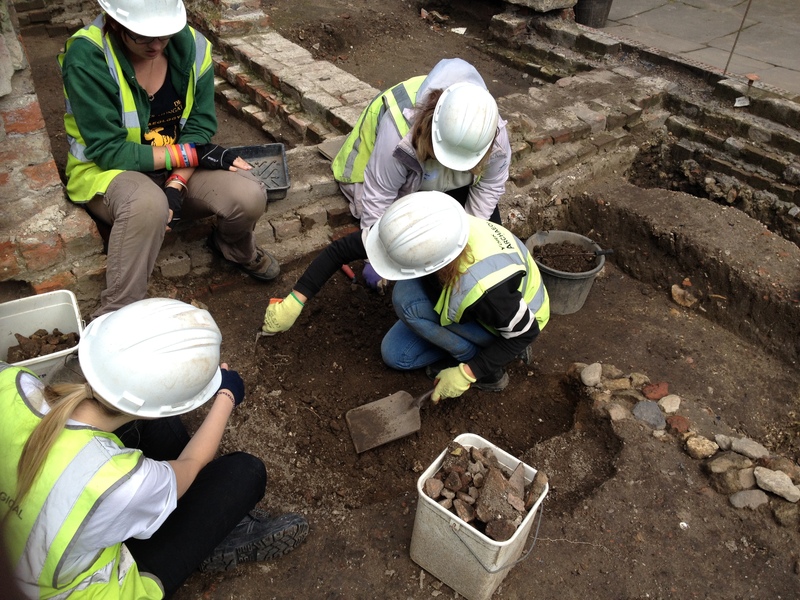 As the grave was cut through almost a metre of earlier stratigraphy, a great variety of finds were present in the backfill. 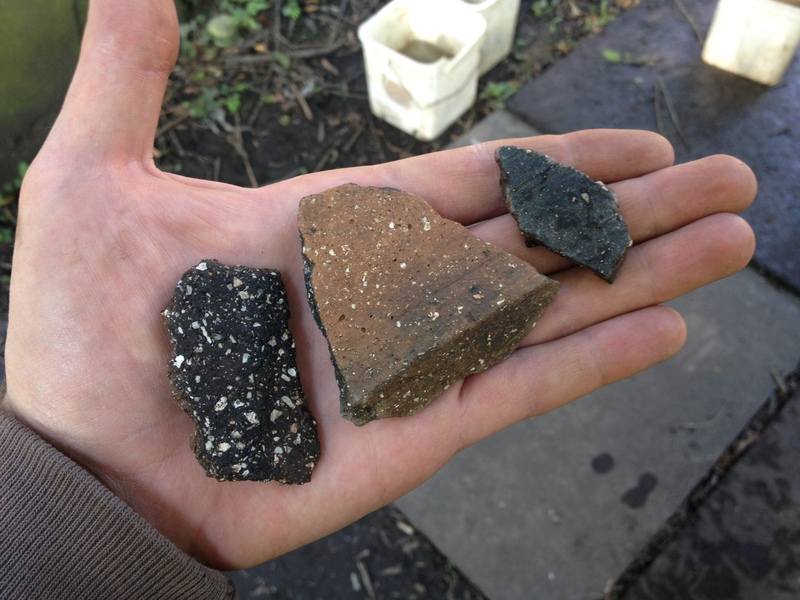 A particular highlight was the shiny, slightly comical lid fragment from a post-medieval pot. 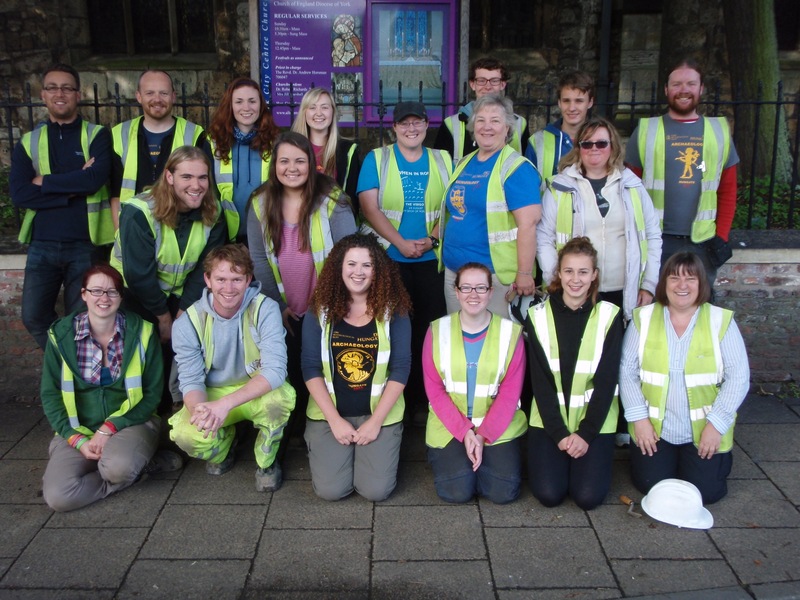 In Gary’s area, the ‘That End’ team looked to make similar progress. 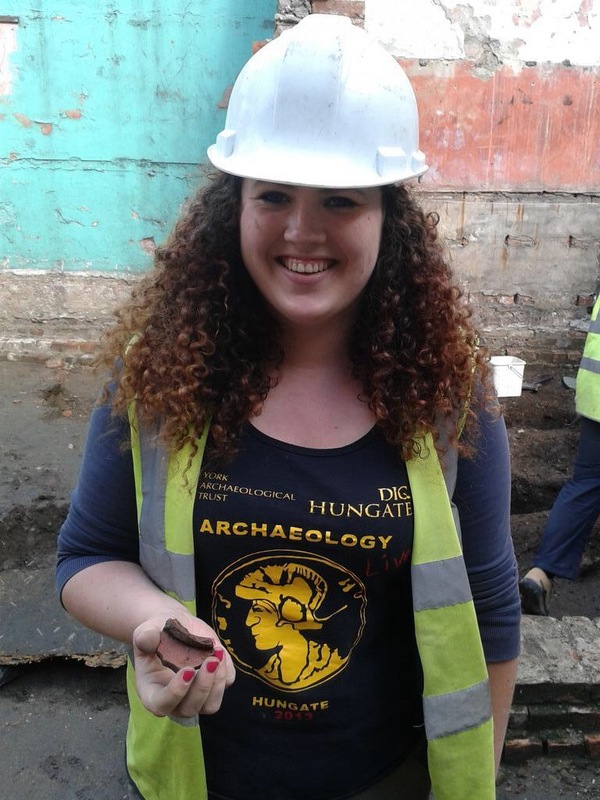 Joined this week by Archaeology Live’s favourite Southern Belle, Lorraine, Beth recorded and excavated the fill of a small refuse pit. Beth and Lorraine’s refuse pit. 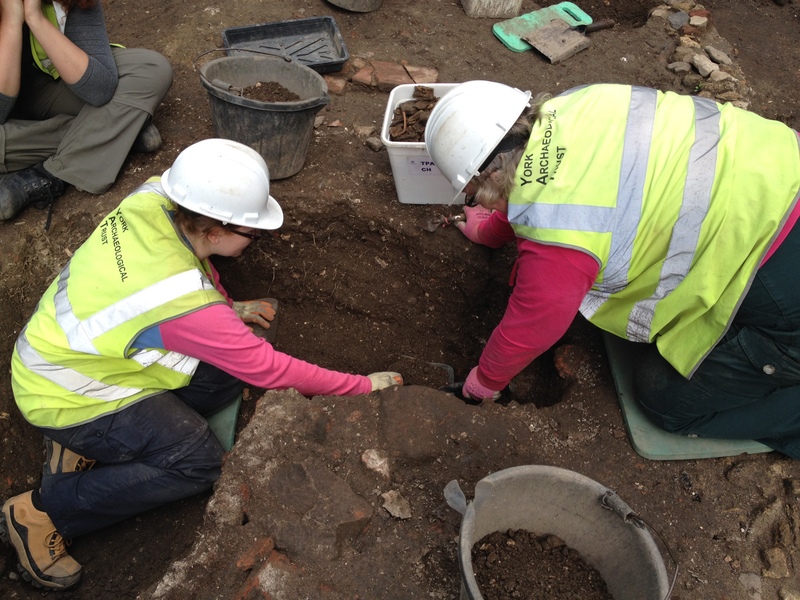 Making a formidable team, it wasn’t long before Beth and Lorraine made some great finds. 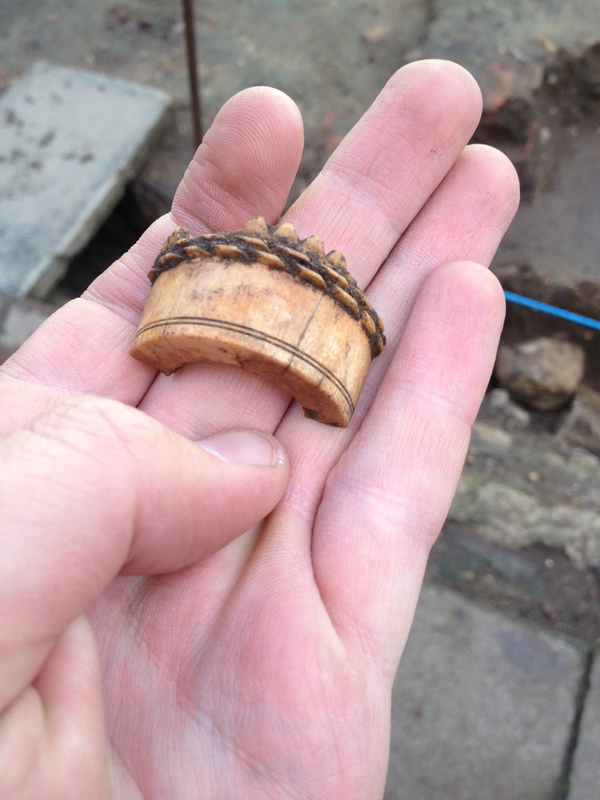 Highlights included a worked bone object with a carved internal thread. It is possible that this could be the decorative end of an umbrella or similar item. It was certainly designed to screw on to something. The excavation of this pit proved that a possible structural feature visible in the section of ‘Biagio’s bone pit’ (see earlier blog entries…) to be almost entirely truncated by later activity. 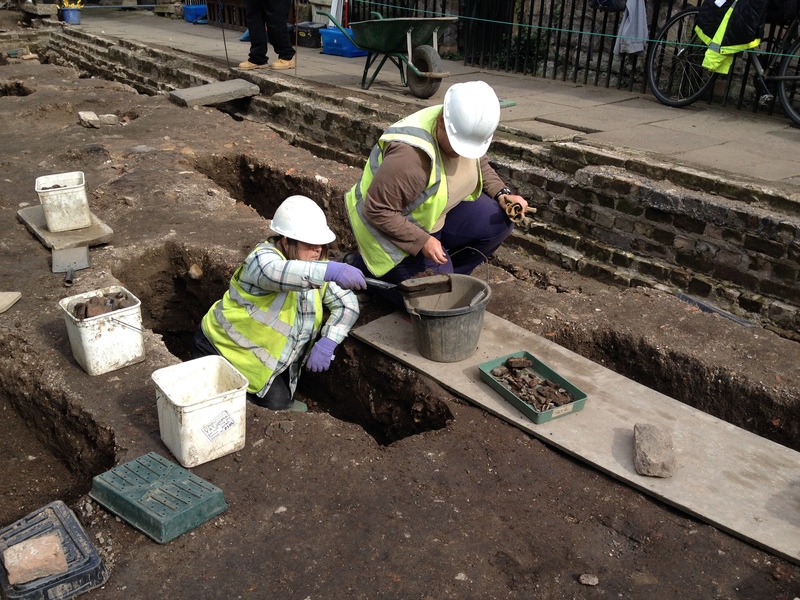 That slight disappointment didn’t stop Beth and Lorraine from enjoying their work, however, as the finds continued to flow. 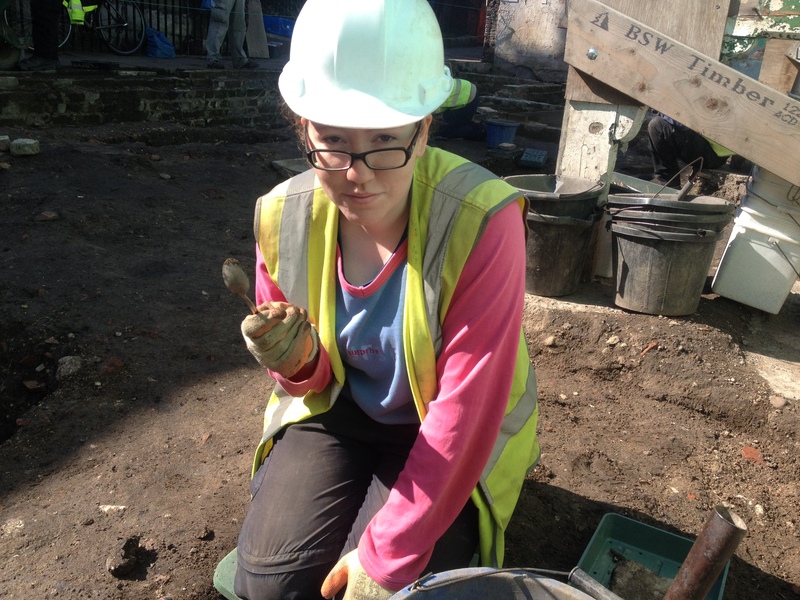 With the pit recorded, the intrepid pair revealed, recorded and excavated a small post hole, forcing Beth to break out field archaeology’s most devastating tool: The Teaspoon. One of a number of emerging structural features, this post hole adds to a growing body of evidence that this yard was a busy working space in the first two decades of the 19th century. 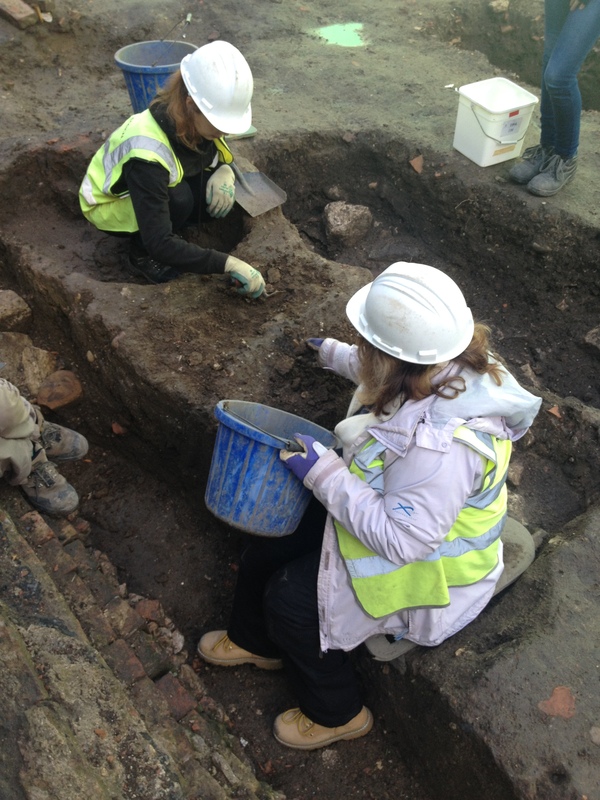 Sandra and Bella began their week of excavation with us by investigating a feature that cut into a cobble surface/footing recorded by Gina and Geoff early in the season. Like Callum and Theo’s feature, this proved to be a difficult task. After a good deal of investigative troweling, Sandra and Bella discovered that they were actually dealing with two features, a shallow pit cut and an infant burial. Sandra and Bella’s area under investigation. Complex relationships like these throw up a lot of records and Sandra and Bella worked hard to clean, photograph and plan each layer and cut edge. 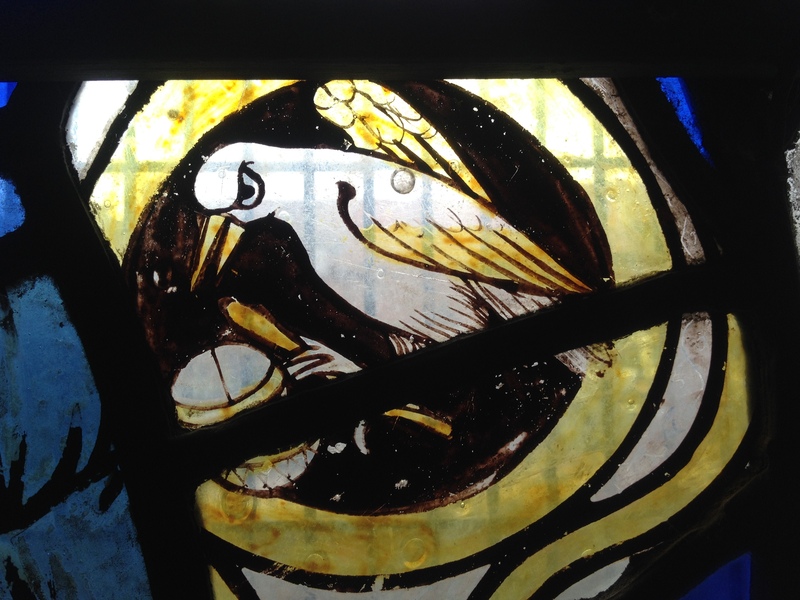 The discoveries made in this area depict an unusual dichotomy. Clearly, this area of 19th century yard space was home to countless pits, tips and post holes, but it was also being used, seemingly concurrently, for burials. 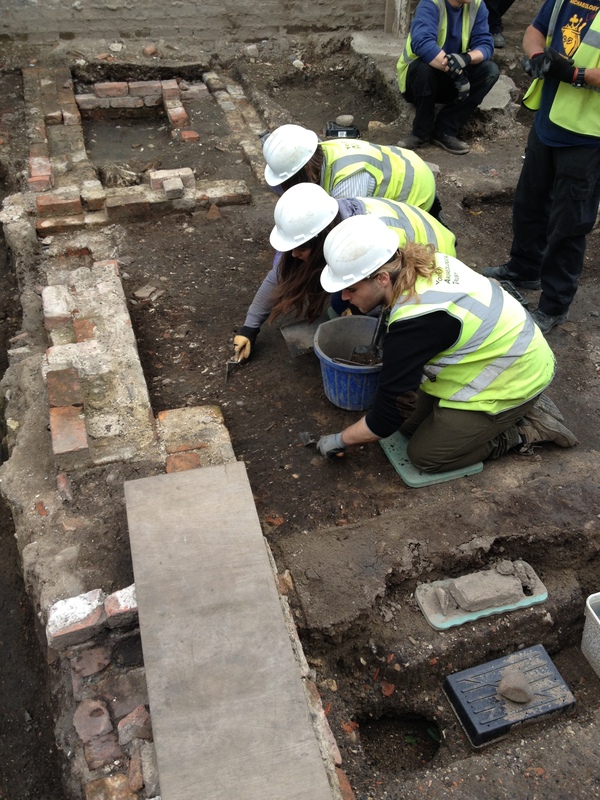 As the ceramics from each context in this area are analysed by specialists, it will be fascinating to see if we can tighten the dating sequence and confirm whether or not the yard remained in active use while it was receiving burials. 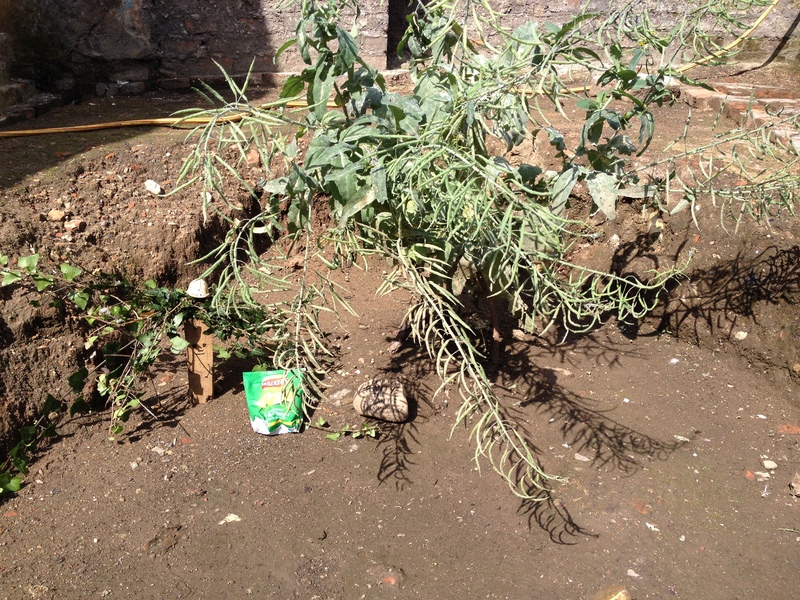 Bella and Sandra ended their week by recording and excavating a small dump of clayey material. This in turn revealed yet another stakehole! Sandra and Bella lifting a clay dump. A busy week in ‘That End’ has added to an increasing cross-site division. 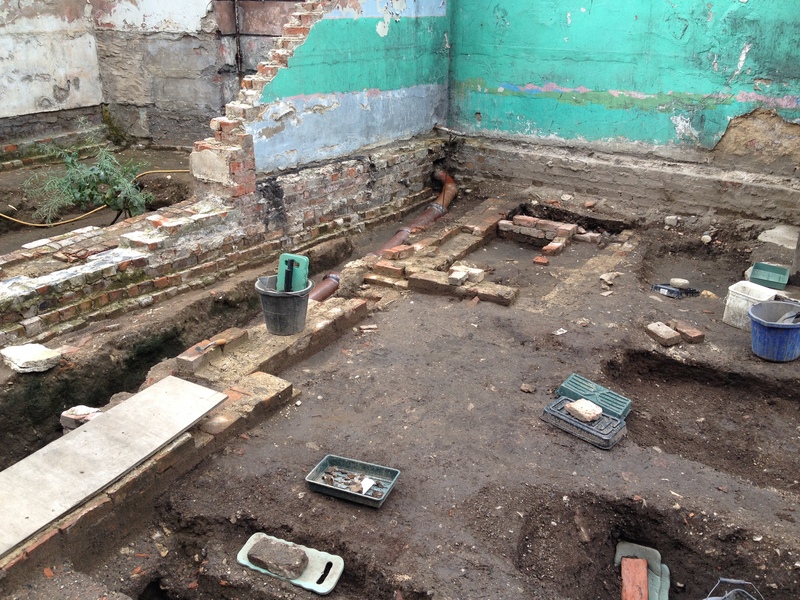 It is certain that refuse pits, structural features and industrial features are increasingly common as you move further from the 18th century rectory building. Clearly, the rector liked to keep such smelly nuisances away from his dwelling. It is interesting to note that the residents of All Saints Cottages couldn’t afford to be so choosy. It’s fascinating to think that these beautiful medieval buildings have only been held in such high regard in relatively recent times; they must have seemed quite old hat in the 1820s. All Saints Cottages border the northern end of the trench. 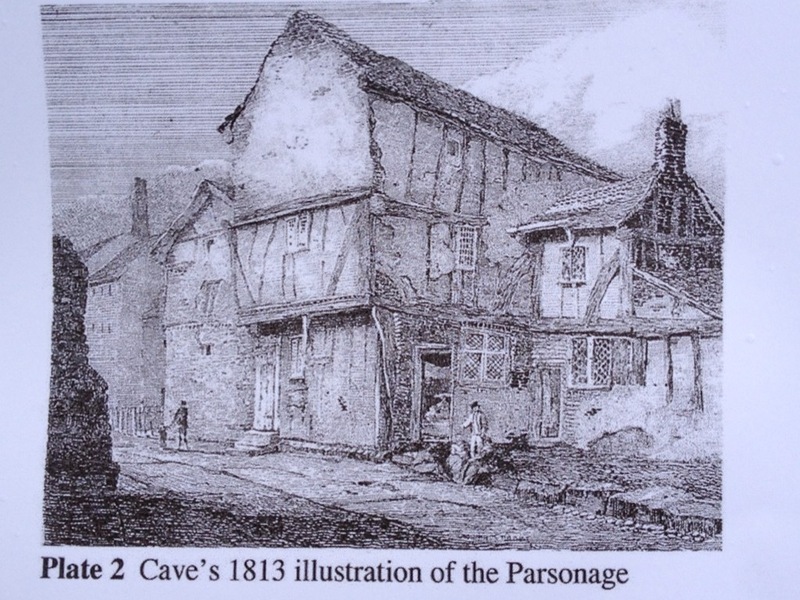 The rectory is depicted in an early 19th century engraving and seems to have been quite a grand residence, even if a little artistic licence seems to have been taken – the footings we have uncovered are a tad smaller than you would expect for such a large building. The north-east wall of the rectory with cesspit annex to the top of shot. The rectory – note the annex to the right. 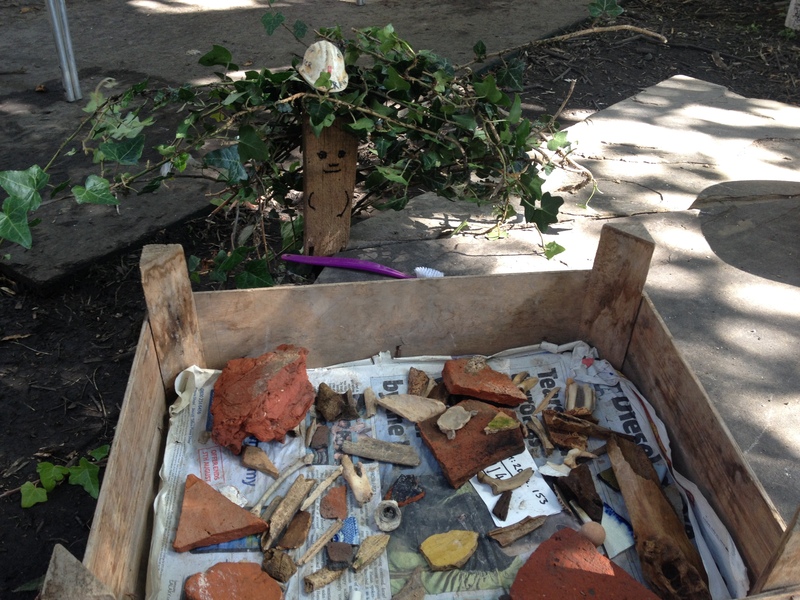 The Tree of Finds enjoyed a wonderful moment as the last of the ‘horn pit’ finds were finally washed. Representing the by-products of the tanning industry, the 15 tubs of cattle skull and horn core proved quite a task to clean! Finds washing revealed a number of treasures that had yet to be noted. 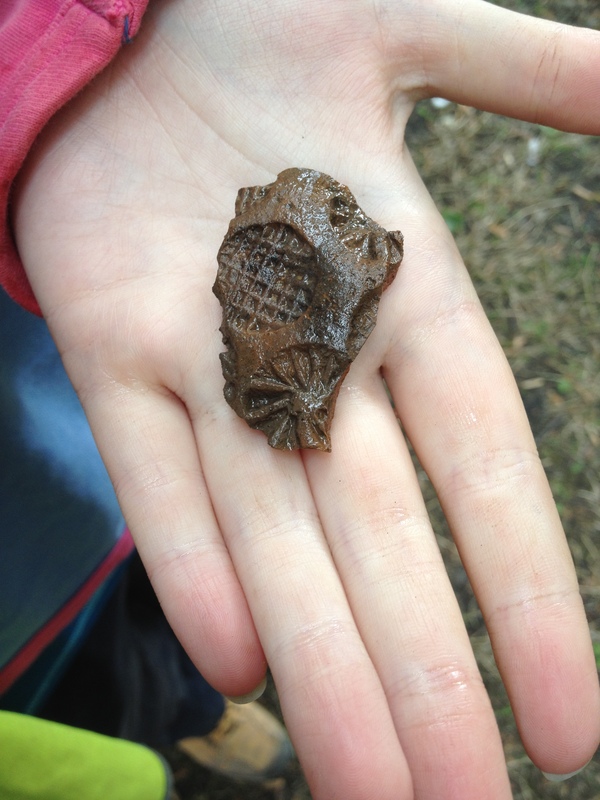 A seemingly innocuous pot sherd was washed by Beth and was found to contain antler stamped decoration. Beth under the Finds Tree. 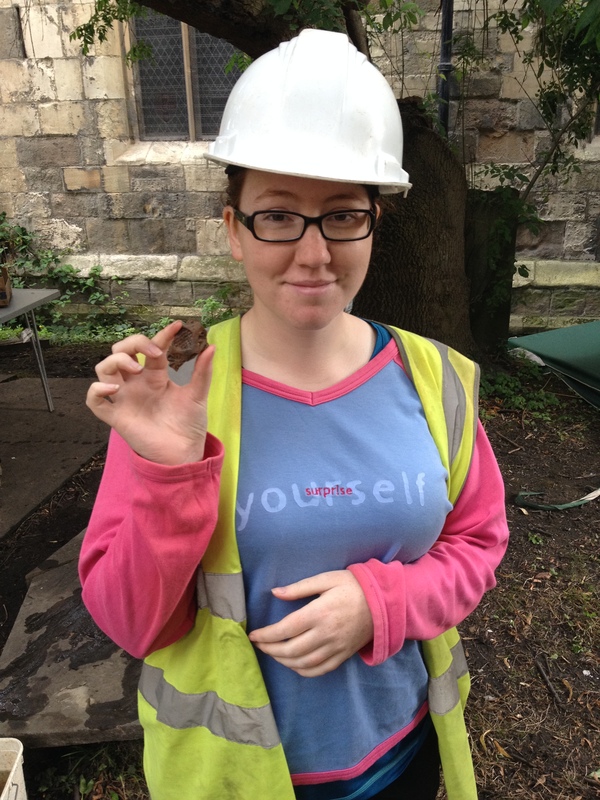 While washing what appeared to be a clump of dirt, Bella spotted this small, well-made copper alloy object. 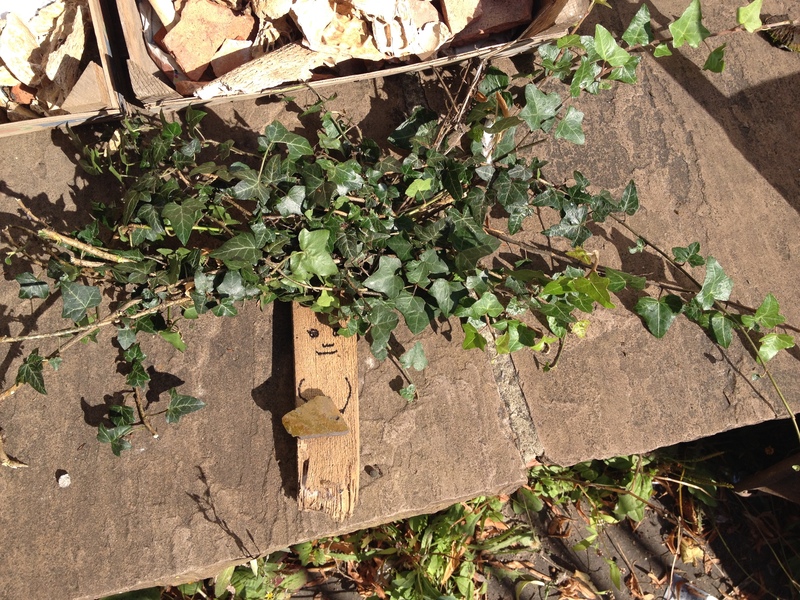 A decorative fitting of some sort, we eagerly await our small finds specialist’s opinion on this one. 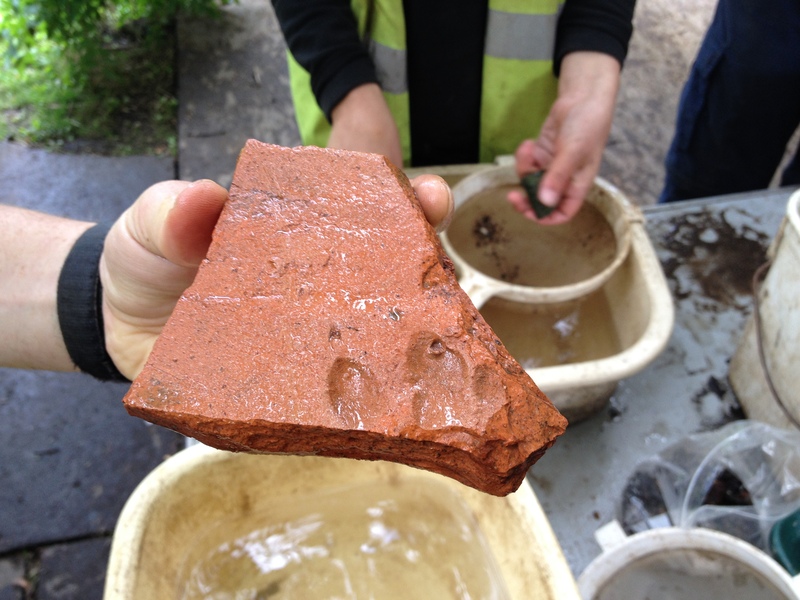 Another amusing discovery was a large dog’s paw print in a medieval roof tile. You can almost picture the tiler’s annoyance at his unruly dog! Often difficult to distinguish between some Roman equivalents, we have nonetheless been noting an increase in Viking finds as we creep into earlier deposits. It bodes well for what lies beneath us! Week 9 has seen our picture of early 19th century activity along Church Lane come into ever sharper focus. 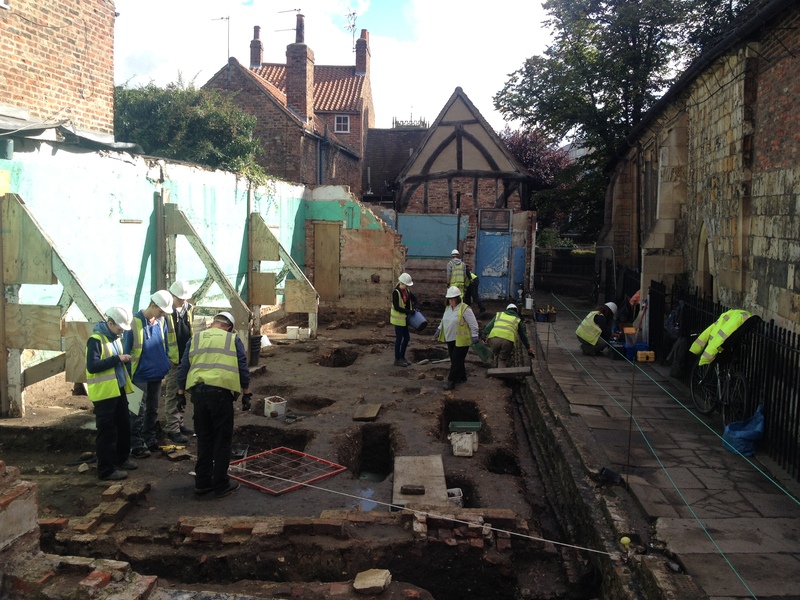 We can see unpleasant activities being pushed away from the rectory at the south end of the yard and kept close to All Saints Cottages to the north; we can also see working life continuing in the yard while it was being incorporated into the church’s burial ground. 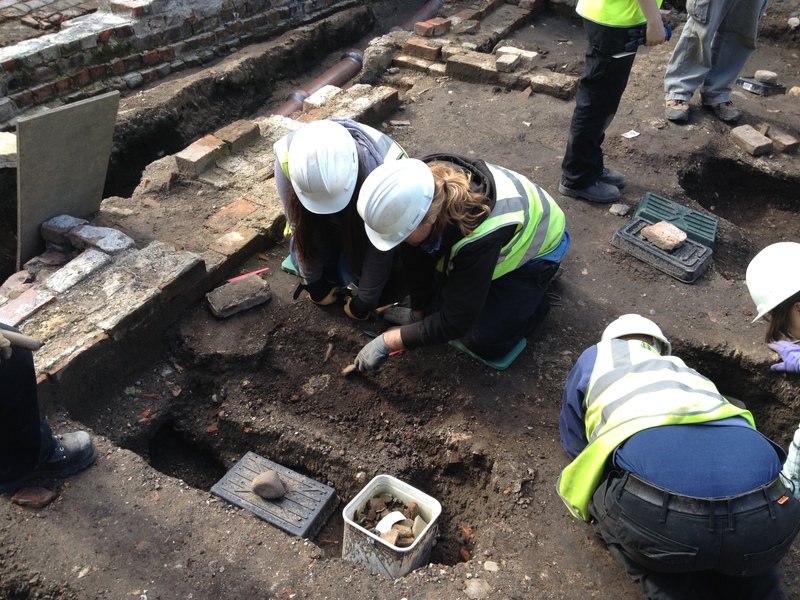 The refuse pits we excavate are giving us new insights into past diets and lifestyles and, as we expose elements of the individuals buried along Church Lane, we are able to meet the 19th century parishioners of All Saints face to face. None of this would be possible without the funding, hard work and boundless enthusiasm of our wonderful team of budding archaeologists. 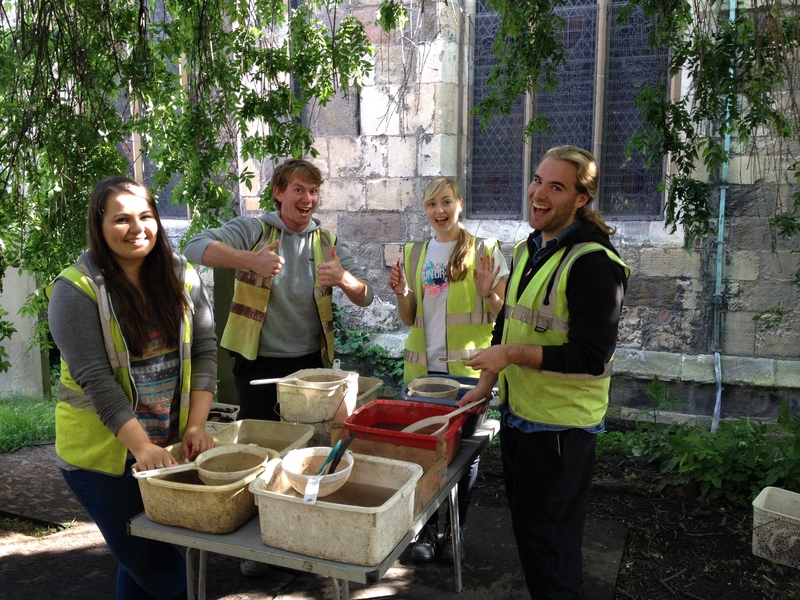 It is people like this that give archaeology such a bright future, thank you to all the week 9 team for another exciting week on North Street! So, now we head in to the closing stages of the summer session. Only three weeks and one weekend to go! It’s been immense fun so far and a genuine privilege to work with such a passionate and diverse group of individuals. Here’s to a big finale! PS. In closing, I’ll leave you with this. Keeping on top of those finds. 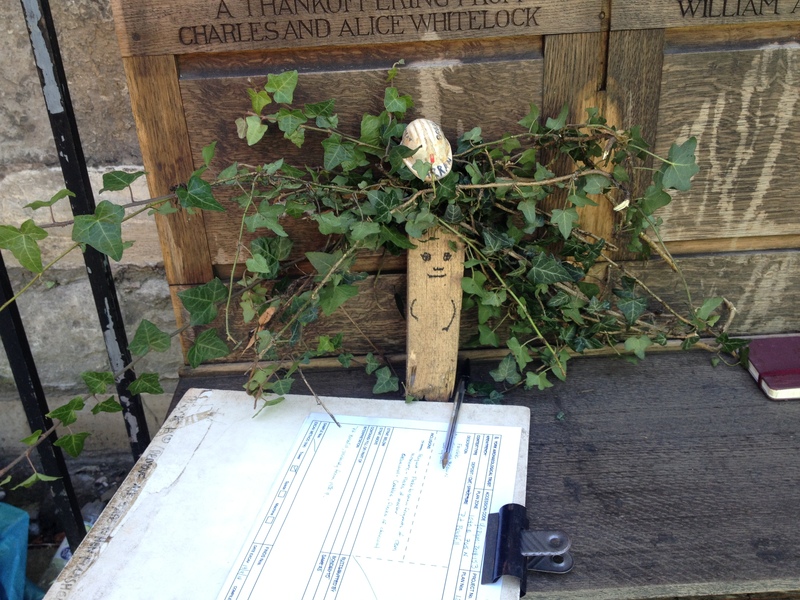 A dinner date with Planty. Becky MkI. Thankfully, alive and well. Archaeology Live! Summer 2014. Week 8.